This giveaway is now closed. Stay tuned to hear the winner announcement. Thank you all so much for entering! Inspired By Finn is offering our readers a giveaway of a Baltic Amber necklace or bracelet that’s the perfect size for a teething baby! Baltic Amber is the most esteemed amber in the world, and the healing qualities of Baltic Amber make it unlike any other type of amber found in the world. When baltic amber is worn on the skin, the skin’s warmth releases trace amounts of healing oils from the amber. These oils contain succinic acid and are absorbed into the skin. Pain Relief: Baltic Amber contains analgesic properties and helps take the edge off of many types of discomfort associated with dental issues, headaches, joint pain, etc. Strengthens the body’s immune system: In many different and subtle ways, succinic acid helps boost the body’s own natural healing ability and immune system. Restoring Energy: The human body naturally produces succinic acid. The salt of succinic acid (succinate) is one of the most active substances in the processes of cellular respiration and intercellular energy creation. Succinic acid restores oxygen and energy supply to depleted cells and helps the body return to a normal, functioning state. Succinate is a raw material and a catalyst in the Krebs Cycle which is one of our main sources of energy. During the Krebs Cycle carbohydrates, fats, and proteins are metabolized for energy. Maintaining Wellness: When the human body reacts to stress, the body’s cells begin to use oxygen more quickly. Oxygen plays a central role in the intercellular creation of energy, and a lack of oxygen can result in feeling lethargic. Oxygen is alkaline-forming in the blood and maintaining a slightly alkaline blood ph helps keep us healthy. Whenever the body functions in a state of low oxygen, it is much more susceptible to illness. To help break a cycle of (chronic) inflammation: Where chronic inflammation is present, disease lurks. When the body’s cells are chronically inflamed the human body’s immune system response is to increase production of free radicals. Chronic overproduction of free radicals results in inflammatory-related disease. Chronic inflammation is a common denominator of many seemingly unrelated diseases. 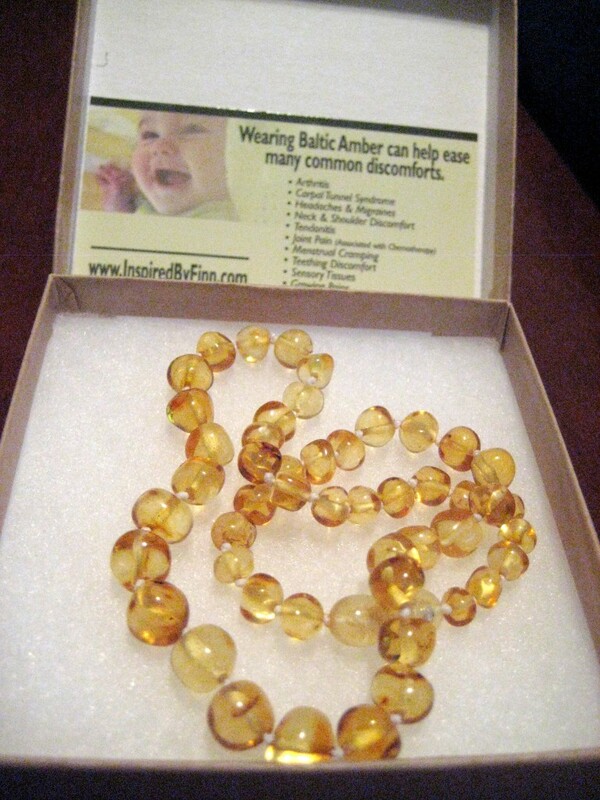 I had the opportunity to review an amber teething necklace from Inspired By Finn. My son is six months old and has been having teething symptoms (fussiness, chewing, drooling, etc.) since he was around three months old. I couldn’t wait to try out this necklace for me and my son! I chose a necklace with a screw clasp (instead of a magnetic one) and yellow round beads. I learned from my research about Baltic Amber that the lighter colored beads and the more opaque beads contain more succinic acid than the darker colored beads. I also learned that round beads—as opposed to the more angular “nuggets”—allow the amber to have more complete contact with the skin, thereby maximimizing the effects of the amber on the body. The teething necklace is meant to be worn—not played with, and not to be put in the mouth. Keep this in mind when measuring your child for the necklace. (Tips of measuring from Inspired By Finn here.) Some people prefer to buy a longer necklace, so their child can wear the necklace for a longer period of time, and some prefer it to be shorter to help prevent it from getting caught on anything. The necklace is designed to break when pulled hard enough, as a safety measure to prevent strangulation. It is not recommended that your child wear the necklace unsupervised or while sleeping. The necklace is knotted in between each bead, so that if it breaks, the beads will not all come sliding off and present a choking hazard. Take extra care with magnetic clasps, as swallowing magnets is extremely dangerous. 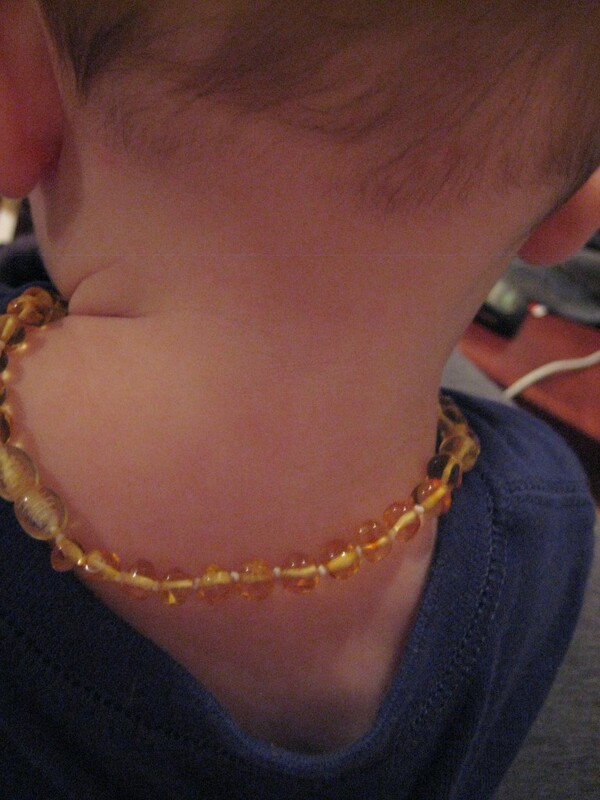 For my son, I found that the Baltic Amber necklace worked just as well as any other teething remedy we’ve tried (cold washcloth, teething tablets, clove oil, etc.). That is to say: I thought it worked some of the time, and it didn’t work at other times. In the interest of full disclosure, though, my son is a “high needs” baby who has sensory processing issues. He’s fussy (putting it lightly) a lot of the time, so he might not be the best child to provide an accurate review of the teething necklace. Out of curiosity one day, I put the necklace on myself, to see if it would help with the headache I was having. I forgot I was wearing it, and went back to what I was doing. Within about half an hour, I noticed that I was feeling pretty good. My headache had subsided, and my tailbone pain (which I’ve had almost all the time since I dislocated it while giving birth) had significantly diminished. I was blown away by the difference I felt when wearing the Baltic Amber! 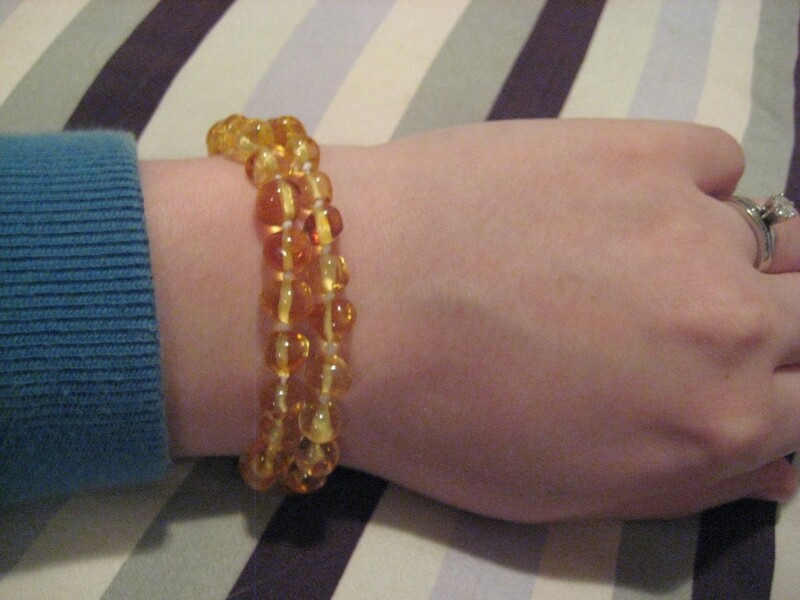 Amber says: my 2 year old has had one since she was 1…worn daily …we lost it for about a month and she was super moody! Have not taken it off since! My 5 month old has worn hers sine she was 1 month old…NO TEETH yet but one happy baby! Not sure if necklace causes that but they sure look cute! Mandi says: Our son has worn his since he was 5 months and has four teeth and another on the way. The necklace works wonders…if we forget to put it on after a bath he is one very cranky little boy. Otherwise we have a very happy little baby! Meredith says: Love our amber teething necklace! Eco Fresh Baby says: I’ve worn baltic amber necklaces since I was 10 and never knew they could be more than a nice accessory. My little boy is always playing with them and now I’m wondering if maybe just maybe it could be the reason he’s never ever required any relief for teething. Cristina says: They’re pretty, but never noticed that it made any difference for my son. Andrea says: My daughter has 5 teeth. She drooled a bit but never was fussy 🙂 Wish I had them with my other kids. I bought a second for my older daughter who has a cogenital hip defect that causes her incredible pain. She usually wakes at night crying from the pain. We had to give her tylenol and motrin every day! She now wears the necklace and a matching braclet. We rarely give her meds now! She never wakes up crying from pain! Kari says: Lovelovelovelove!! My son has never woken up at night due to pain, has minimal drooling and a fairly consistent happy demeanor ever since we got his many months ago. I only know if he’s got a new tooth when he’s nursing and I finally feel it! 🙂 I recommend them to everyone I hear complaining about teething. So, there you have it! Many people swear by the healing properties of Baltic Amber. It’s a safe alternative for those parents wanting to avoid medicating their children with topical anesthetics or over-the-counter pain relievers (like Acetaminophen or Ibuprofen) when teething pain gets bad. Amber can help adults and children alike, and everyone will look great wearing their amber jewelry! You can buy amber necklaces, bracelets, and anklets for adults and youth from Inspired by Finn’s online shop. Most necklaces are in the range of $17.95 to $28.95, depending on length and intricacy. Some specialty items are more, and bracelets and youth items are less expensive than adult necklaces due to the smaller length. For your chance to win a baltic amber necklace or bracelet from Inspired by Finn, enter in the comments below! The winner can select anything 16 inches or smaller that is in stock. Contest is open to U.S. and Canada. Visit InspiredByFinn.com and tell us what item you like most! 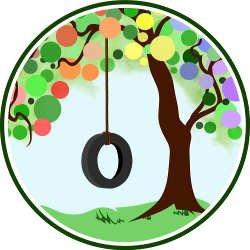 This is a joint giveaway with Natural Parents Network and Anktangle, a natural parenting blog. You may enter at one site only, and we’ll be recording IP addresses to ensure that there are no duplicate entries. That said, please do check out and enjoy both sites! Tell us something you learned about amber. Tell us if you’ve had any experience before with amber for pain relief. Tell us what you expect to use this jewelry for. Contest closes January 6, 2011, at 11:59 p.m. PST. love the oval pumpkin butter non-elastic bracelet <3 beautiful! I like the Great For Boys Lemonade and Tea necklaces. We haven’t used amber for pain relief before. I plan to give this necklace to my eight month old to help with teething. I subscribe to NPN on Google Reader. I like NPN on Facebook. Thanks for the giveaway! 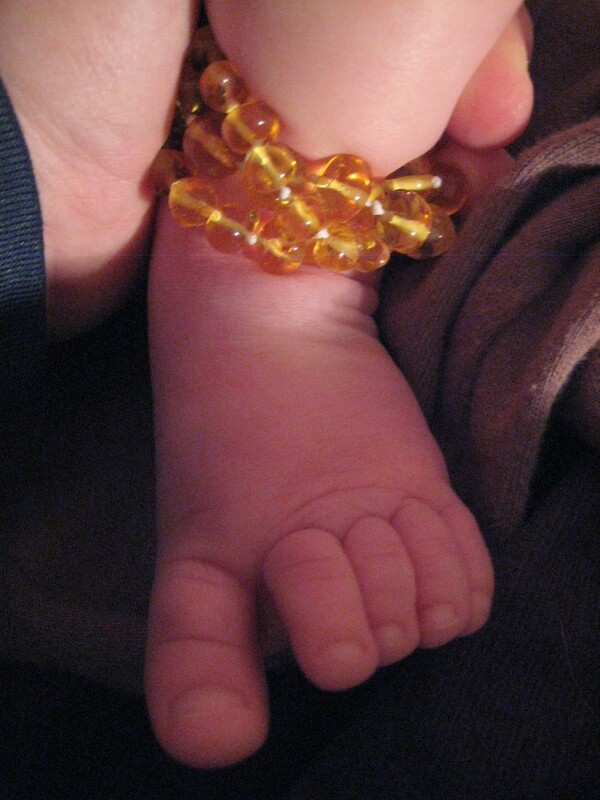 I learned that even adults can use baltic amber, it works on more than just teething pain. I’ve never used baltic amber, but plan on getting some soon! I like the youth lemonade necklace.